City council is poised to give us another one of their unwanted presents in their final regular meeting of the year. As part of the quality of life projects the city is going to add a “Chihuahuan Desert Project” to our zoo. The agenda includes an item to award a design and consulting contract to a firm from Missouri to handle this project. The firm will develop the concept, design the facility, and oversee the construction of the facility. Actual construction will be a separate contract. Meals (Food Costs): Meal receipts are not required. Actual costs are allowable up to a maximum Per Diem allowance of $51.00 per day or current State of Texas rate applicable at the time cost is incurred. Meals are only reimbursable with overnight lodging away from headquarters. Tips and alcohol are not reimbursable. Receipts are not required. Alcohol is not reimbursable. How will the city know if they do not have receipts? The contract has mistakes in it. Personal Automobile Mileage: Up to the rate of .575cents per mile or the current State of Texas rate applicable at the time cost is incurred. Expense report must clearly identify the departure/arrival time, To/From destinations and purpose of trip. Even tightwads are willing to pay more than half a cent per mile. State law does not allow bidding services of this type. Instead the city must use a different evaluation process commonly called a “beauty contest”. The winner of the contract is the one that city staff likes the most. Is there no firm in El Paso that could do this work? I suppose we should be happy that the city did not have to go to Germany for help like they did with what used to be our plaza. Then again why do we need a zoo exhibit to show us what we live in every day? Wouldn’t we want our kids to have an opportunity to see something different? This entry was posted on Thursday, December 24th, 2015 at 5:22 AM and is filed under City government. You can follow any responses to this entry through the RSS 2.0 feed. You can leave a response, or trackback from your own site. 16 Responses to Another disaster brewing? This could be a useful addition to the educational tools here…Tucson has a fantastic site, the Arizona-Sonora Living Desert, which shows off the life of that desert, and attracts huge numbers of people. The lack of understanding of our desert is part of the reason why so many people dump trash, thinking it is useless and ugly. My main concern about this is that it is way too small. No mountain lion or jaguar confines its movements to a space that size. We will see “zoo animals,” which are not the same as the actual animal, and some of them may die as a result. The space limitations of zoos for animals, especially mammals, are one of the reasons I seldom visit zoos. There is no substitute for the real Chihuahuan Desert. The public documents don’t get into details about the plants, geology, and how other incredible features of our landscape will be incorporated. In reality, they can’t all be in any human-made facility. I just hope this new zoo facility encourages people to go out and take advantage of the real thing such as at Hueco Tanks State Park, Franklin Mountains State Park, northern Chihuahua Mexico and southern New Mexico.. Exactly right…unfortunately there is little likelihood of the city abandoning its inadequate zoo. None of the places you mention really are focused on presenting the Chihuahuan Desert per se- maybe in the new visitor center for the Franklin Mountains State Park there can be some explanatory displays. We can hope. this is pretty standard terms and conditions….not sure why this is an issue. all travel done by every city employee no receipts are required for meals, the contract follows the same rules city, county, state and federal contracts do. I’ve just read the documents on the City Council agenda for the Chihuahuan Desert Project at the Zoo. I’m embarrassed to have commented earlier without reading the documents. Now I see that this is a design project for construction of a $10 million dollar major new Zoo habitat of 92,000 square feet which will include a long list of animals, including jaguar and mountain lion, species new to the El Paso Zoo. This will be much more than something that “we live in every day.” It will have important educational and interpretive information about the Chihuahuan Desert which is lacking in El Paso. I’m not surprised that there isn’t a design firm specializing in zoos in El Paso. The experience of PGAV includes services for world class theme parks such as Bush Gardens and Sea World. PGAV Destinations have created designs for major zoos in the United States. You say “Wouldn’t we want to give our kids the opportunity to see something different?” On paper it seems that this exhibit WILL give our kids the opportunity to see something different – a wide range of Chihuahuan Desert animals they will never see in the wild and a feel for the four major habitat zones of the Chihuahuan Desert – riparian, scrub desert, grasslands desert, and mountain woodlands. I will be much more caution in the future to believe what I read in blogs. I hope it includes geologic features as well as the fauna. Would you be kind enough to post the link for this document, I have gone over the city site several times and cannot find it. Was it discussed on the 22nd? City Council Agenda of Dec. 22, Item 20.1, refers to contract with Peckham, Guyton, Akers & Viets, Inc. Does not mention the Zoo in the agenda listing. Click on the agenda item 20.1, in the right hand column there is a file, click to download, it is multiple pages, takes about 40 seconds to download. Save money, have people on I-10 east or west. They can’t even keep safe the animals they already have. Three gazelles have died over the last six months. An 8-month-old kudu antelope died during a vasectomy in September. A vasectomy at 8 months? A lion-tailed monkey died in April. A few years ago, some dogs got into the zoo and killed an antelope and a crane. A rare tiger killed another tiger the zoo wanted it to mate with, which in all likelihood was caused by the animals being introduced wrongly. One elephant was beaten to death. A few years later, an employee had to be terminated for beating an elephant. Would you want to be in the care of these people? If they want a desert exhibit, just give them a few cacti. Those are hard to kill. I agree, totally messed up as usual. What does it tell us that we live in the Chihuahuan Desert and we know so little about it that we need an exhibit in the Zoo? In the meantime we have another city facility, the El Paso Museum of Archaeology in the Northeast with 15 acres of Chihuahuan Desert which is being killed by neglect, inadequate budget, inadequate staff, and use of large machinery to mess up the arroyos that go through the site. 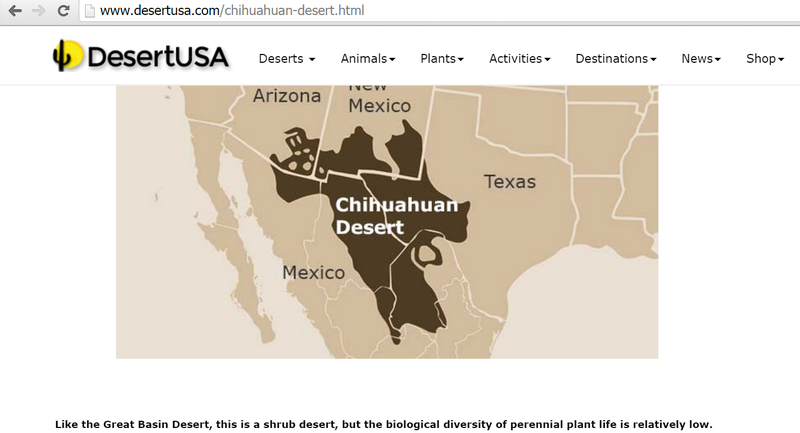 This site could be a fabulous INTERPRETIVE CENTER for the Chihuahuan Desert and the Ancient People who made a living from the desert – but no, we have to have a little “Chihuahuan Desert Experience” at the Zoo. Or they could drive 250 miles to Tucson and ask the people at the Sonoran Desert Gardens how they do it. It is the finest desert zoological garden in the world. We do have people here in El Paso who are experts on the Chihuahuan Desert and its plants, no need to go to Tucson. The difference between Tucson and El Paso is not expertise, it is the political will to embrace our landscape and its people – ancient and contemporary – as our identity. In El Paso we have abandoned our identity in favor of an homogenized landscape. Look at the city’s adopted tree list – it should be all natives, instead, natives have a back seat to “adapted” and “naturalized” non-natives, some of which are invasive. You mean like the Sonoran Desert Museum in Tucson? Firm! What firm?! Why in the name of all that’s holy could they not consult with faculty and students at either UTEP or EPCC, or both?! Do they truly believe that we lack local experts on our own environment? And, they will get away with this latest ripoff of local taxpayers, won’t they?